I was delighted to have been invited to contribute to the 2012 edition of the excellent Building Conservation Directory. My article is on 'Early Twentieth Century Shops'. You can view the publication online using the tremendous 'flipping book' facility or can order through Cathedral Publications. 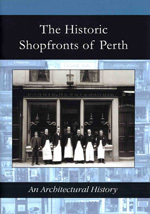 Scotland’s Shops published 2010 by Historic Scotland. Two hundred page book with extensive illustrations which maps the history and development of retail buildings in Scotland. Includes conservation case studies. It is available priced at £15.00 from Historic Scotland (tel 0131 668 8638).